There are plenty of places to skydive in the Georgia area, but honestly, there is a lot more to skydiving than just jumping out of an aircraft. We feel a dropzone’s intention should not just be to “sell” tandems. To reduce skydiving to a mere transaction of a service for money undercuts the true value of a jump, and sadly, a lot of skydiving in Georgia comes down to an exchange of goods for a price. Skydiving is a transformative experience, and the primary goal at Skydive Monroe isn’t to make the sale. The goal of skydiving at Skydive Monroe is to help empower people through an experience we love. Our mission at Skydive Monroe is not to make the sale and boot you from a plane at 14,000 feet (though we do like the part where you help you take flight). Rather, our intention is to show you that despite adversity, despite fear, you can do anything. 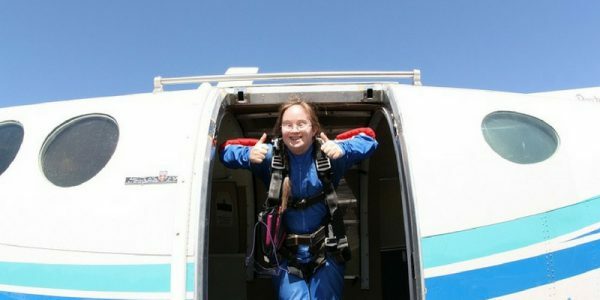 At Skydive Monroe, we are lucky enough to work with a group called Extra Special People (ESP). ESP is a social services organization that operates out of Watkinsville, Georgia and strives to provide opportunities for individuals with disabilities and their families to engage, connect, and thrive. They serve a range of people from children to adults with behavior disorders, Cerebral Palsy, Down Syndrome, Autism, Asperger’s Syndrome, Fetal Alcohol Syndrome, Angelman Syndrome, Spina Bifida and others. One of their most popular services is the Extra Special People Summer Camp. This summer camp enables individuals with developmental disabilities the chance to enjoy a social and recreational opportunity they might not otherwise have. For the past seven years, Skydive Monroe has hosted ESP at the drop zone for an event which is now called the Big Jump. ESP uses the unique experience of skydiving as an opportunity for the community to engage with their mission and to show support for all extra special people. The Big Jump is a day-long event that helps to raise funds for individuals to attend the ESP summer camp. Individuals spend the months prior to the event fundraising, and when all is said and done, to celebrate the completion of their fundraising efforts, they make a skydive. The efforts of these caring individuals make it possible for children and adults of all abilities to have access to rewarding experiences and programs. This year the event will occur May 12th. One woman that can attest to the transformative and empowering experience of a skydive is Annie Curry. Annie Curry completed her first tandem skydive in Georgia at Skydive Monroe several years ago because of Extra Special People and an extra special person, her son. Annie has a son with Down’s Syndrome. Someone within the organization mentioned to Annie that she could fundraise to help cut costs for sending her son and other differently abled individuals to ESP’s summer camp with the Big Jump. Before then, she didn’t even know there was a place to skydive close to her in Georgia. Not only is Annie now on the committee of Extra Special People, she is also a licensed skydiver who jumps regularly at Skydive Monroe! The event itself has grown a substantial amount. Though it began with only 12 jumpers it has grown to a point where now 40-50 jumpers make a skydive during The Big Jump. Skydive Monroe recognizes what a special opportunity it is to help change someone’s life with skydiving and are glad to be a dropzone that views tandem skydiving differently. We are a facility that is focused on making a difference not just making a profit. Here it is about engaging with the community and setting ourselves apart. We don’t want to just sell you a skydive. We want to give you an experience to show you just what you can do! If you want to also help and empower someone through skydiving, you can donate to ESP or help sponsor a jumper. And, if you want to experience the joy of a skydive yourself, we’d love to take you on a tandem skydive from 14,000 feet!